Guinness and chocolate are two of those incredible flavors which, when combined, work special magic together to create a delicious treat you won't soon forget. The slight bitterness of the famous Irish stout offsets beautifully with the chocolate. 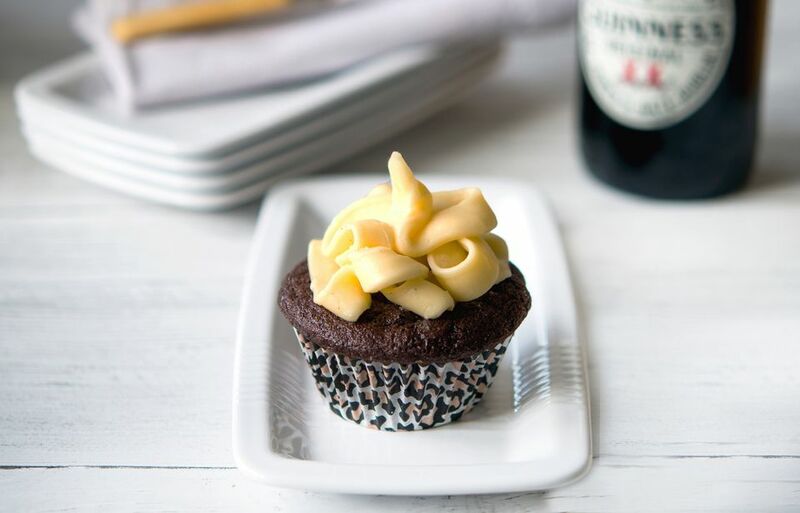 Add to that all the lovely ingredients below, and a frosting rich with delicious, creamy Baileys Irish Cream, and you will see why these Guinness and chocolate cupcakes will fast become a favorite treat for the grown-ups. The cakes are merely mixed together in a bowl and guarantee super-light cakes that are heavy and sweet on taste. These cakes are not recommended for children, as they do contain alcohol. Place the melted, cooled butter into a baking bowl. Pour in the Guinness and stir. Sift in the cocoa powder and add the brown sugar, stir until dissolved. Add the yogurt and vanilla to the beaten eggs and stir well. Then add to the Guinness and butter, stir well. Sift in the flour and bicarbonate of soda and stir until you create a thick, glossy batter. Place 12 cupcake liners into a 12-hole muffin tin and divide the cake batter equally taking care not to fill more than 3/4 full, or the cakes will spill over the top. Bake in the center of the preheated oven and bake for 20 minutes. The cakes are ready when they spring back when lightly pressed. Remove from the oven, cool in the tin for 5 minutes then place on a cooling rack. Leave the cupcakes to cool completely. To make the frosting, use an electric whisk to beat the butter and icing sugar (aka confectioner's sugar) until light and fluffy (if you do not have an electric whisk, use a hand one). Beat in the vanilla and Baileys Cream. Taste and if you like your frosting sweeter, add more confectioner’s sugar a little at a time. Once the cupcakes are completely cold, decorate with the frosting as you wish. The cakes will keep for up to 3 days in an airtight box un-iced, and all freeze exceptionally well for one month. Defrost slowly in the refrigerator. The frosting will also keep for several days in the refrigerator covered and also freezes well. Again, defrost slowly in the refrigerator before using, do not use the microwave. If the frosting melts, you will not be able to recover it.